Three works by British composers, each for viola and orchestra but only one dubbed a Concerto. Avoidance of that term is justified in the case of the Vaughan Williams which is a series of instantly engaging and artfully limned mood miniatures. As for the Bax Phantasy it could have been called a 'Concerto' and no-one would have blinked. These scores, written between the two world wars, have poetry aplenty and, in the case of the Bax and RVW, drama puts in an appearance from time to time. Hong-Mei Xiao has a stirring broad tone and her instrument is recorded with close-up impact. Neither does the orchestra - familiar from various Naxos productions (Rozsa, Weiner, Zador) - lack vibrant power. Their Naxos Bloch CD centres on the viola and features the same violist so they clearly have some familiarity with each other. 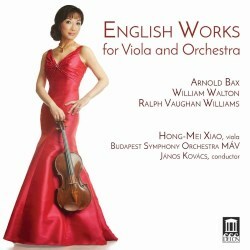 The Bax piece has a singing beauty that is both wild and hoarse and this recording is excellent. Choosing is thankfully irrelevant as each disc on which the Phantasy features is differently coupled. The competition includes Golani (Conifer), Chase (Dutton alongside the same RVW Suite) and the all-Bax disc from Dukes (Chandos). The Delos Phantasy epitomises success in its surrender to Bax's romantic sun-soaked peace (13:00-14.00) as well as his martial kinetic excitement. The performance has great torque with an eager response to the mercurial mood shifts. There is much to enjoy here. The work's last few moments make a link I should have made before: it's with Moeran, whose dust-raising jig in his Violin Concerto may well have picked up a few ideas from the Phantasy. The Walton work, alongside the same composer's Cello Concerto, has always been a Cinderella for me and has rarely caught inspirational fire. Even if it falls a few rungs short of a BBC concert performance I once heard from Walter Trampler, this Delos version rebuts my expectations of something low key as much as the equally problematic yet triumphant Walton Cello Concerto on Lyrita. I have heard more electrifying versions of the last movement, but this is pretty good. In the Vaughan Williams work nothing outstays its welcome. Rather like the same composer's Six Studies in English Folk Song from six years earlier and Finzi's clarinet Bagatelles this is an irresistibly toothsome collection of eight movements. The Prelude is utterly enchanting, the Christmas Dance goes with a rasp and a wheeze, the Ballad (5:33) is pastoral-rhapsodic and Howellsian in its warmth and the chattering impatience of the Moto Perpetuo is like Parisian Martinů at his most sec. The Musette registers as another Finzian carol with its steady harp ostinato. The Polka Mélancolique is filed to a very satisfying harshness - close to what we hear in the Bax Phantasy. The chatter of the closing Galop recalls the gymnastics of the Tuba Concerto. It makes a perfunctory ending but that's my only reservation. If you are interested, the same Suite can be heard in quite different viola couplings from Frederick Riddle on Chandos, Power on Hyperion, Callus on ASV and Chase on Dutton. There's a lot going for this collection: conviction from the musicians, well documented and sporting immediate sound.